While it is possible to keep slider turtles together in the same habitat, it is best to segregate them by size. While red-eared sliders (Trachemys scripta elegans) are not highly aggressive turtles, cannibalism can and occasionally does, occur. Even if your hatchlings avoid being eaten by the adults, they must still compete with them for the finite resources of the cage, such as food, space and basking spots. The most serious problem that can arise from keeping hatchling turtles with adults is that the adults may eat the hatchlings. Baby turtles are not a dietary staple for red-eared sliders in the wild, but in captivity they may not be able to turn down such an easy meal. Other species, particularly soft-shelled (Apalone ssp.) and snapping turtles (Chelydra serpentina) regularly eat hatchlings. To limit this possibility, only house turtles over 3 or 4 inches in length with the adults -- by this time, they are much less likely to be bothered by the adults. 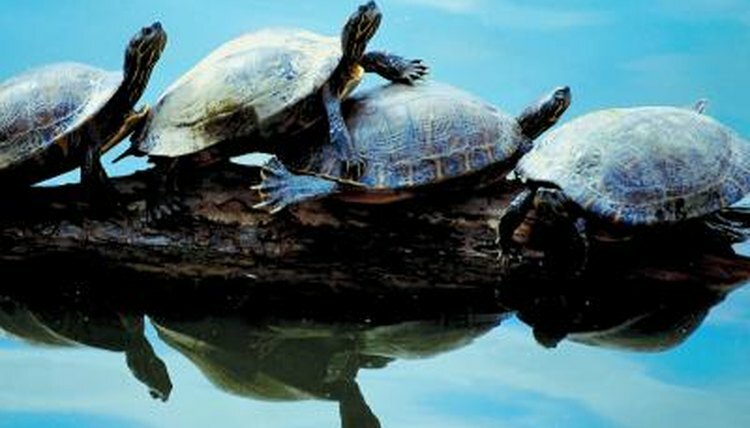 When turtles of any age live in the same aquarium or pond, they must compete for the resources that are available. This includes resources, such as cage space, food and basking spots. Without enough tank space, the adults will constantly push and shove the hatchlings around, potentially injuring them in the process. In the wild, basking sites often hold many turtles, stacked one atop another. However, hatchlings usually only share basking spots with other hatchlings, or seek out isolated rocks and logs to bask on. Because of the frenzied activity that accompanies feeding time, it is very dangerous to have young turtles feeding near adults -- accidental bites are commonplace, as anything moving is fair game. The constant competition that takes place when turtles cohabitate can take a toll on them. It may cause them to linger in protected areas of the cage, further limiting basking and feeding opportunities. Stress can cause inappetance and depression as well as suppress young turtles' immune systems, leaving them vulnerable to infection. While adult turtles are sturdy animals, capable of withstanding the pushing and shoving that accompanies cohabitation, young turtles do not fare as well. The shells of young turtles are not as hard as those of the adults, and their skin is much thinner than that of the adults. An accidental nip from a cagemate may not cause significant injury to an adult; however, the same accidental nip may amputate a hatchling’s limb. What Animals Get Along With Red Ear Sliders?